I love how I used a bright and sassy Designer Paper that first made me think of summer for a fall card. I know I'll be able to use up my whole pack! 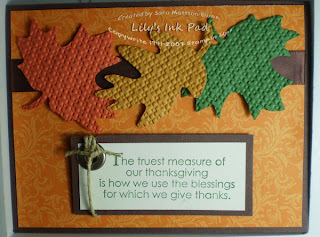 The leaves were first cut with the Big Shot and then run through again inside the Square Lattice Embossing folder. Easy and fun. Very pretty love how you embossed the leaves too.